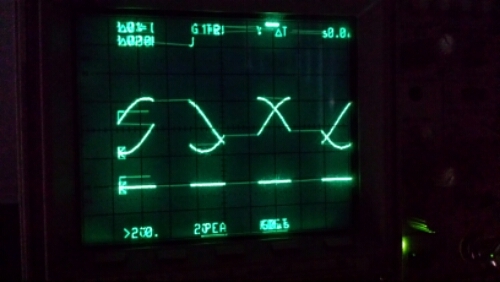 My guess as to what I’m seeing: a pretty significant bit of the input to the DAC (digital to analog converter) that sets the beam’s horizontal position is stuck, causing the display to break up and overwrite itself in unreadable stripes. This display is of the vector type. There is no linear, raster scanning like in television or computer monitors; it’s more like an electron beam Etch-A-Sketch. Two DACs driven by the microprocessor set the beam’s horizontal and vertical deflection and it excites the phosphor wherever it lands. A control grid in the cathode ray tube allows it to be blanked to be moved without lighting the phosphor it crosses. When this skipped around the beam wasn’t blanking; you could see it smear right back. I tried power cycling. It’d be okay a minute or so after a minute off then do that again. I tried clearing all settings and memory. I tried looking through the service manual. The problem immediately cleared and does not come back. Why didn’t I try this first? Am I losing my mind here?! The fault was likely a loose connection at a backplane connector, socketed IC, or ribbon cable down inside, or maybe even a cracked solder joint. If it recurs I’ll investigate, but for now I’ll rest easy knowing I don’t have to replace this wonderful scope I’ve used for years with some soulless modern piece of Chinese plastic poo that can’t actually do X/Y plot mode right.